Check out this amazing antique automaton depicting people bowling. The piece is being auctioned now and is estimated to bring between $13,000 and $15,000! 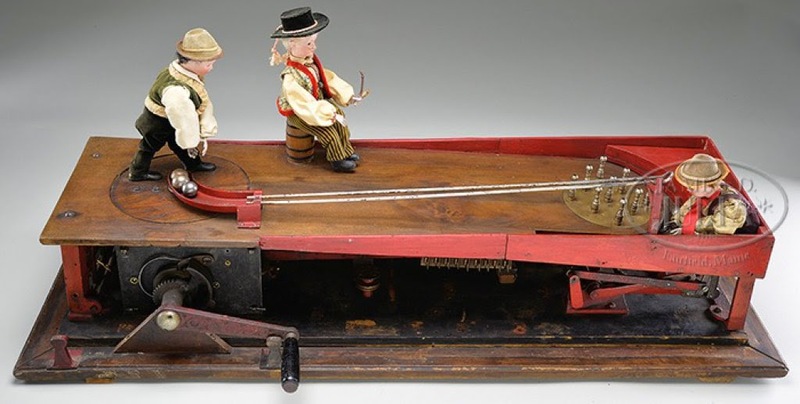 Patented in 1907 by Otto Eichenberger of Switzerland with the assistance of Leon Brock of New York, this intricate and large automaton with a vast number of actions centers on a most popular past time of the early 20th Century. The machine consists of two bisque headed gents, one poised to roll one of several steel balls down the alley to an array of nickel-plated skittle pins at the other end while the other enjoying his pipe looks on. A third bisque headed figure appears to reset the pins while returning the balls to the bowler. Beneath the "stage" is a complex motor and a throng of mechanics to power the various motions. Once displayed at the AMF Corp, the leading American Bowling Industry Company. Housed within a glass and carved/etched dome-top wood cabinet with great patina that only adds to the stunning presence of this piece. Here is where you can see more photos of this Bowling-themed automaton.